Former Rep. Melissa Rooker will become the executive director of the Kansas Children’s Cabinet. Kansas Gov. Laura Kelly today announced that she was appointing former Fairway Rep. Melissa Rooker as the new executive director of the Kansas Children’s Cabinet and Trust Fund. In the role, a full time paid position, Rooker will oversee the cabinet’s effort to evaluate the effectiveness of early childhood education and development programs in the state, as well as efforts aimed at the prevention of child abuse and neglect. 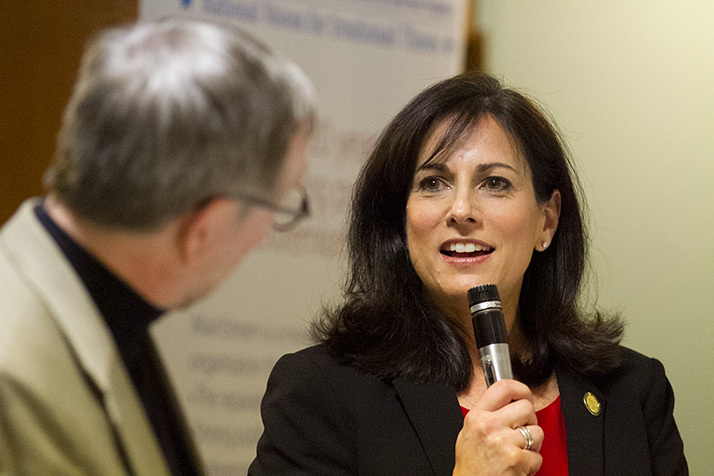 In making the announcement, Kelly said that she had come to know Rooker as a “steadfast advocate for Kansas children and families” during their time working together in the statehouse. Rooker said she was honored by the opportunity. Kelly also announced that Kim Moore, the longtime president of the United Methodist Health Ministry Fund in Hutchinson, would become the organization’s chair. Rooker, a Republican, served three terms in the state House of Representatives before losing her re-election bid this past fall to Democrat Rui Xu by 121 votes. During her time in the statehouse, she was deeply involved in K-12 finance issues, and argued for increased funding for early education programs. Founded in 1999 following the legislature’s decision to devote 95 percent of proceeds from the Master Tobacco Settlement to improving the health and well-being of kids in the state, the Children’s Cabinet and Trust Fund advises elected officials on the most effective use of the money and to assess and evaluate the initiatives it funds. Amid the prolonged budget issues Kansas faced during the latter part of Gov. Sam Brownback’s tenure, Brownback had proposed securitizing the tobacco settlement money as a way to shore up the state’s finances. That move would have posed an “existential threat” to the Children’s Cabinet, Rooker said. It ultimately failed to gain traction. Rooker’s first day on the job will be this coming Monday.